I was riding the subway home on October 11, which happened to be National Coming Out Day, and there were posters for PFLAG (Parents, Families, Friends & Allies of Toronto's LGBTQ community) posted in the subway station that had me thinking. The words in this poster are the exact ones I said to my parents. It was the hardest thing I had to do, yet it was the most freeing thing I could have ever done. It allowed me to finally be myself, it allowed me to finally be happy and it allowed me to live my true authentic life. Seeing these posters brought me back to the night I came out. I remember when I came out to my mom I wasn't sure how she would react. I was nervous and scared. I was afraid of being rejected for being who I am. I was afraid she wouldn't love me anymore. It was just her and I. We were having dinner and I said to her, trying to hold back tears, "Mom I have something to tell you. Before anything happens to you or Papa I want you to know who I am. 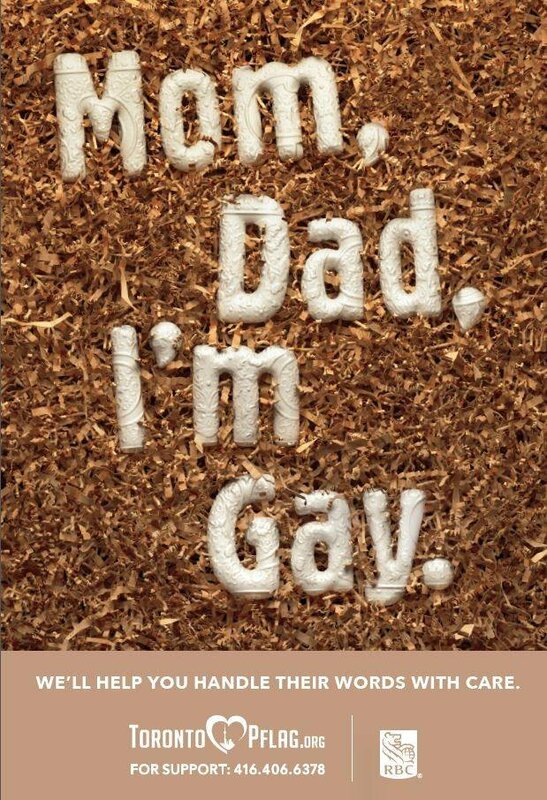 Mom, I'm gay." And then I burst out crying. The first thing she did was hug me and said, "You are my son, and I love you no matter what." I was relieved, I was happy, I was free. The closet can be a dark place, but opening that door and stepping into the room made life bright and worth living. Although my parents are accepting, they had struggled with it. They sought help and guidance to help them understand what I was going through, as well as to help them understand how to deal with their feelings. As a parent, we always want what is best for our kids. Now being a dad, I of course only want the best for my son. I could never imagine any parent not being there for his or her child. Not supporting them, not loving them. Unfortunately not everyone has parents who accept them and love them for who they are. I could never fathom a parent disowning his or her child, abandoning them and not loving them unconditionally. You are only days old and you have so many people that love you! You were a dream of Daddy and Papa's for so long that we cannot believe you are finally here. We want you to know that we love you with all our hearts. We will always be here for you. We will always support you in whatever you want to do in your life. We will try our best to protect you. We will always love you! We hope that when you grow up, you will be happy, you will be brave and kind, you will stand up for others and you will be supportive of everyone. You treat others with respect, and treat yourself with respect. Accept other people for who they are. Even if you do not agree with them, or they do not agree with you. Be tolerant but most important JUST BE YOU. Whatever you decide to do in life we will be there right behind you, supporting you and cheering you on. Daddy and Papa will always be here for you no matter what. We love you with all of our hearts!" People say Milo is so lucky he has two loving parents that love him so much. We feel it is the opposite. We are the lucky ones. We were blessed with such an amazing little boy that loving and supporting him is only second nature. Frank and I were destined to be parents. All of our life's experiences will help us raise Milo to hopefully be the person who he is meant to be. I often wonder if the reason we are more accepting of other people is because we are gay. Are we more empathetic and sympathize more easily? All our life we just wanted to fit in and be "normal," and I feel that if Milo came to us in the future and said he is gay, trans or even straight (could you imagine?!) we would be 100 per cent supportive of him. Parents still have a hard time accepting their children for who they are. Everyone just wants to be loved and accepted for who they are. Love is love.